According to the international version of the Diagnostic and Statistical Manual of Mental Disorders, 'the essential feature of the Dissociative Disorders is a disruption in the usually integrated functions of consciousness, memory, identity, or perception of the environment'. 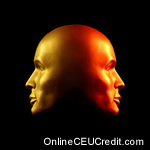 Put simply, dissociation is a psychological mechanism that allows the mind or body to split off or compartmentalize traumatic memories or disquieting thoughts from normal consciousness. Dissociative Amnesia — distinguished by a persistent loss of memory of significant personal information, typically of a traumatic or stressful nature, that is too all-embracing to be explained by normal absent-mindedness. Dissociative Fugue — defined by an abrupt, non-scheduled journey away from one's home or usual place of work, accompanied by a loss of memory of one's past, confusion over one's identity, or assuming a new identity. Dissociative Identity Disorder (DID — formerly Multiple Personality Disorder) is the most extreme form of dissociation. It is characterized by two or more separate identities or personality states that recurrently take control of the individual's behavior, accompanied by a loss of memory of significant personal information that is too all-embracing to be explained by normal absent-mindedness. Depersonalization Disorder — defined by an unrelenting or frequent feeling of disconnection/detachment from oneself (mind-body split), during which reality testing remains intact. Depersonalization is sometimes accompanied by derealisation (a sense that the external world feels strange or unreal). In a clinical setting, depersonalization may be described in terms of 'looking down or in on oneself', 'standing beside oneself, 'outside oneself, 'blank spells', or as a 'floaty, foggy, dazed out, phased out, zoned out, or trance-like feeling.' In some cases, the 'I' may be dissociated — for example 'she is not me'. In derealisation the environment may be experienced as two-dimensional, strange, unreal, or The individual may perceive an uncanny alteration in the size and shape of objects'. (DSM, p. 500) In this context self-injury can serve as an extreme grounding technique to bring oneself back to the here-and-now ('I do exist", 'I am alive/real'). Some individuals who engage in self-injury are amnesic during the act, reporting that they feel shocked when they realize they have injured themselves, or describing how they wake up in a pool of blood without knowing they have hurt themselves. In the case of self-injurers with Dissociative Identity Disorder (DID), one hypothesis is that a persecutory 'alter" personality may punish the "host" personality or another 'alter" in the system (for example, if the 'host' or an 'alter' discloses abuse to a therapist during the course of treatment). Interestingly, Ross (1997,p.151)[sup7] argues that, 'the persecutor's underlying motivation is actually positive'. This is a view I share and if we return to the example given above, one positive scenario might be that the persecutory 'alter' believes she/he is acting in the 'host's' best interests. In other words, she/he is trying to prevent the truth coming out about the abuse for fear of 'not being believed' or other possible dire consequences (for example, the 'system' being emotionally overwhelmed or flooded with memories, mental disintegration, or rejection and abandonment by significant others). Ross goes on to explain that, 'Most often, the persecutor is a misguided protector whose behavior makes sense within her own world view: The first challenge to the therapist is to understand the persecutor's universe, and the laws that govern it.' (p. 151). I agree with this. The preceding section contained information about understanding dissociation. Write three case study examples regarding how you might use the content of this section in your practice. What is the DSM description of Dissociative Identity Disorder? Record the letter of the correct answer the CEU Answer Booklet.